Bailing Out Homeowners: What Does It Mean? As everyone should know now, the basic problem is that tens of millions of people (urged on by bankers, financial advisers, economists, and politicians) bought homes at bubble inflated prices. The bubble is now bursting so tens of millions of people now live in homes that are worth substantially less than what they paid, and in most of these cases, much less than what they owe on their home. One point on which it should be possible to agree is that we should want the bubble to deflate as quickly as possible. While many economists have hugely exaggerated the problem caused by deflation (who cares if prices are rising 0.5 percent a year or falling 0.5 percent a year? ), there is a real problem associated with falling house prices. Declining house prices mean that the people who buy homes in the current market will see a loss on their home. If they can’t absorb this loss, then the bank that makes the loan (or whoever holds it) will absorb the loss. Rather than a program of house price supports, the country would be best served by a crash the bubble policy. The big problem in this story is that the folks who somehow could not see the largest housing bubble in the history of the world are still running economic policy. Unlike custodians and dishwashers, economists are not held accountable for their job performance. For this reason, we should expect many tough times ahead. 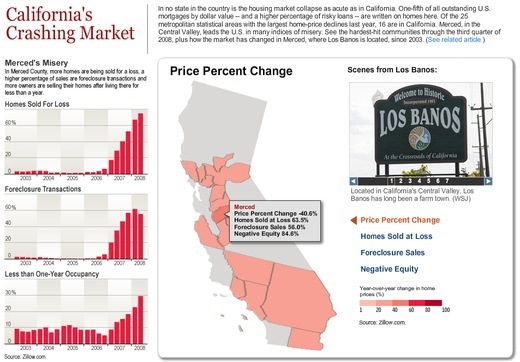 Apropos Baker’s argument, and via Barry Ritholtz, we have this WSJ graphic (click it for a larger interactive version) on the real estate disaster across much of California. Previous Previous post: Bubble, not crunch!